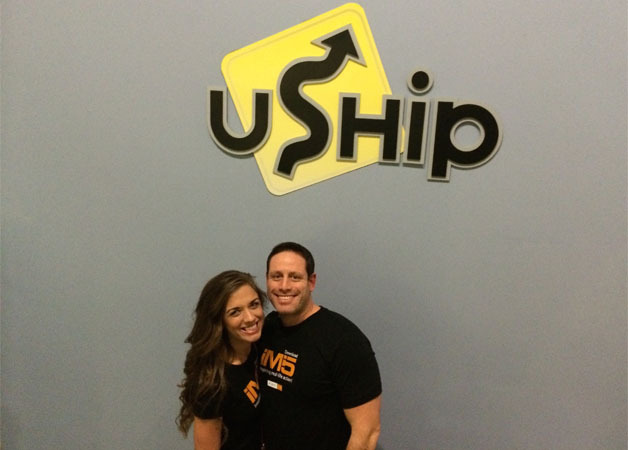 If the name doesn’t ring a bell, uShip is a global online auction house for shipping services and is featured on Shipping Wars, a reality TV series on A&E. The show follows independent shippers who bid on shipments through uShip that traditional carriers usually won’t haul. Since I’ve been watching Shipping Wars on and off the past 2 years the sign displayed on the building instantly caught my attention. Although I was going to make time to visit uShip while I was in town, I had more important things to do such as launch our social network. So, the next day when my team and I were gearing up for the Austin Startup Crawl I reviewed the crawl map and noticed that uShip was the very last stop on the list. Bingo! I thought that this was a perfect opportunity to check out yet another reality TV filming location. We arrived at uShip at 7:30 p.m. that evening and the entrance to the building was packed with people. The place was definitly jumpin’. As soon as we made our way inside we noticed a nice-size uShip sign hanging on the wall and asked a friend to snap a few photos of us standing in front of it.